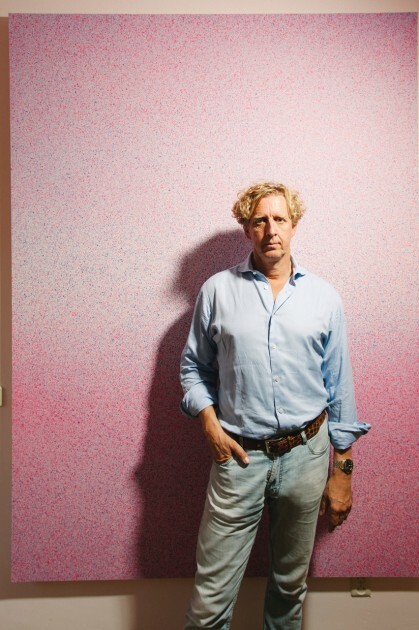 Acting as a lawyer specialising in divorce law, Antoine de Werd is also a passionate collector of both tribal art and contemporary art. Through exploring the overlaps of these two genres he compiled a unique and outstanding art collection. 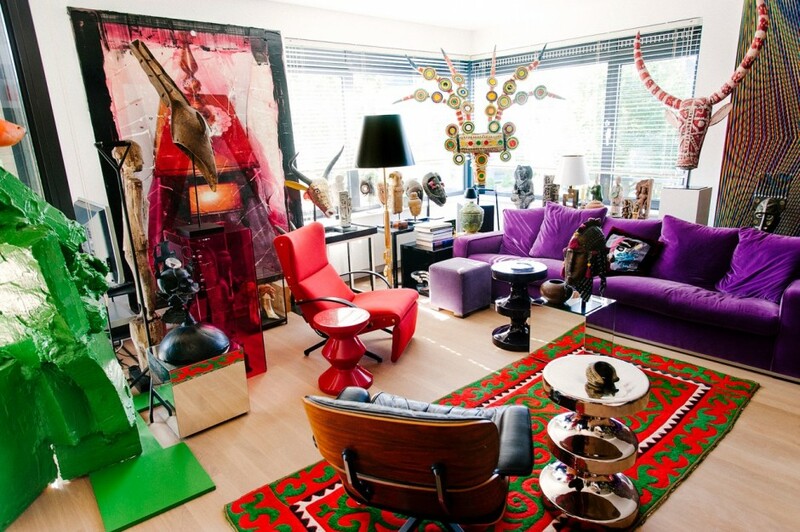 Every centimetre of his apartment is packed with hidden treasures, ranging from Dogon and Khmer masks to abstract paintings by emerging artists. 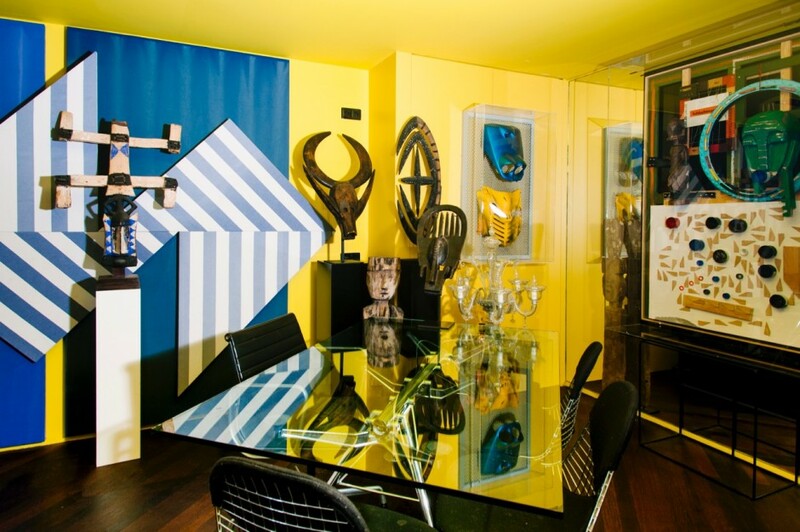 Antoine de Werd has shared with Larry’s List how he curates and hangs his collection, instigating wonderful dialogues among his beloved tribal masks and abstract paintings. Antoine de Werd in front of Zane Lewis. Courtesy of Antoine de Werd. What made you want to start collecting art? I became more and more interested in modern and contemporary art during my study. A visit to an exhibition of Kandinsky in the Centre Pompidou in Paris was an eye-opener for me. I started buying art when I began to work as a lawyer at the age of 25. At that time, I had no intention to build a collection. What was the first artwork you purchased? How many artworks do you own today? The first work I bought was a figurative painting from a local artist. It didn’t hold my interest for long and I sold it. I own about 500 artworks. My collection consists of abstract paintings, sculptures, photos, some video works, tribal/ethnographical pieces and antiques from various origins, such as Persia, Egypt, Khmer, Gandhara, China, India and Europe. From left to right: Borden Capalino, Tribal art (Khmer, India, Gandhara), Florian & Michael Quistrebert. Courtesy of Antoine de Werd. I have different reasons for collecting. The most important reason is that I love art. It stimulates, gives me pleasure and it sets me thinking in different patterns. I need to be surrounded by art: at home and at work. Another reason for collecting is the hunt. It gives me an enormous kick to find new artists, new works and to then try to acquire pieces. Thirdly, it is a way of life: reading about art, visiting museums, galleries, fairs, studios, and being with artists. My goal was not to build a collection — that just happened — at a certain moment, I happened to have a collection. On a short term, the goal is in fact to acquire the next piece. You are collecting contemporary as well as tribal art. Could you please tell us a bit more about the focus and the works in your collection? I focus on contemporary art and tribal art. This combination is exciting. Artists like Picasso, Matisse, Brancusi and Klee also collected tribal art. The influence of tribal art can be found in their works. William Rubin, a former director of MoMA, wrote an important book on Primitivism and contemporary art. In the case of contemporary art, I am mainly interested in abstract work. In tribal art, I prefer to acquire masks, especially from Mali, Burkina Faso and Oceania. A good Dogon mask in combination with a strong abstract painting can be superb. Good tribal and contemporary pieces combine well and make each other stronger. From left to right: Alke O, Dogon statue, tribal pieces, Thomas van Linge, Michael Tedja. Courtesy of Antoine de Werd. 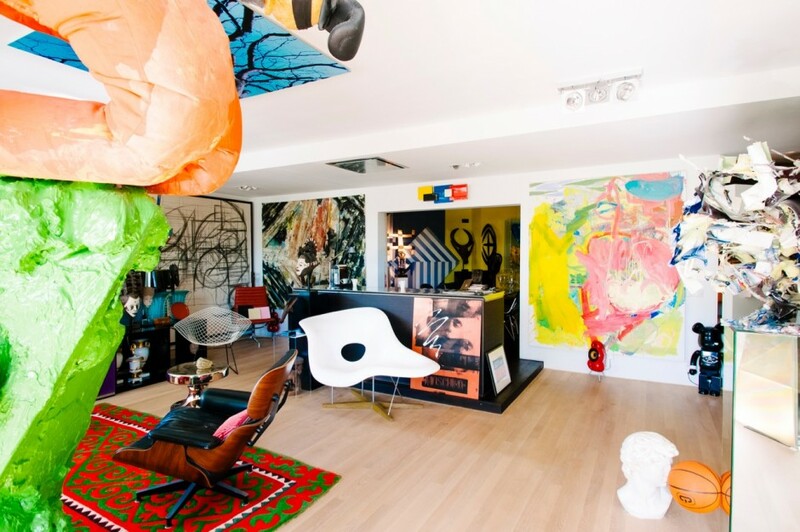 Your collection includes many young, abstract painters. How do you think this genre will develop? I strongly believe in abstract painting. Painting will never disappear. There are many ways for an artist to make a painting; with or without paint. I like both. Artists who use paint may find it difficult to be renewing and distinctive. Artists who don’t use paint have more possibilities in my opinion. They have fewer borders. An example is material painting (with chemicals, beer, concrete, tarp, synthetics). One can conclude that it is really difficult to make good art for both groups of artists. It is exciting to see the works all these, mostly young, artists create. Some of them are hyped and a lot of them will disappear within a few years. It is not easy to be an artist for a lifetime. An artist needs patience and must avoid to be too eager. What makes tribal art so interesting for you? Mostly a good tribal piece has a strong presence, especially a bigger mask. I like that. Tribal art expresses human emotions and rituals, using certain universal forms. It is remarkable to see that a hundred years ago people in different parts of the world, who had no contact with each other and who only know their own small village, used the same forms. These forms are sometimes still used by artists. There must be something universal. I call it the field. From left to right: Patrick Hill, Kasper Sonne, Evan Robarts, and Susani’s gowns from middle Asia. Courtesy of Antoine de Werd. Where do you buy tribal art? Is it difficult to find an original Khmer sculpture? I mainly buy tribal art in Paris and Brussels. It is always a pleasure to be in those cities and to talk with experienced tribal gallery owners. The preferred gallery in Paris was Albert Loeb, whose father already sold works of Picasso and tribal pieces in the 1930s. It is a pity that Albert, who is around 85, closed his gallery recently. Finding Khmer sculptures is not very difficult. What makes it difficult is to find a good original piece in a certain price range. Many artists (e.g. Picasso, Pollock, etc.) were inspired by tribal art. Do you see connections between contemporary art and tribal art in your collection? Sure, I see connections. I know that some of the artists from whom I own work are inspired by tribal art. I have a big painting from the French artists Michael and Florian Quistrebert. That work is full of lines. From a distance however, you can discern a pair of (animal) eyes. I placed an old Dogon mask in front of this painting. They seem to belong to each other. From left to right: sculpture David Bade, Peppi Bottrop, Graham Wilson, Alek O, Hanna Perry, Anke Weyer, Heringa Van Kalsbeek. Courtesy of Antoine de Werd. 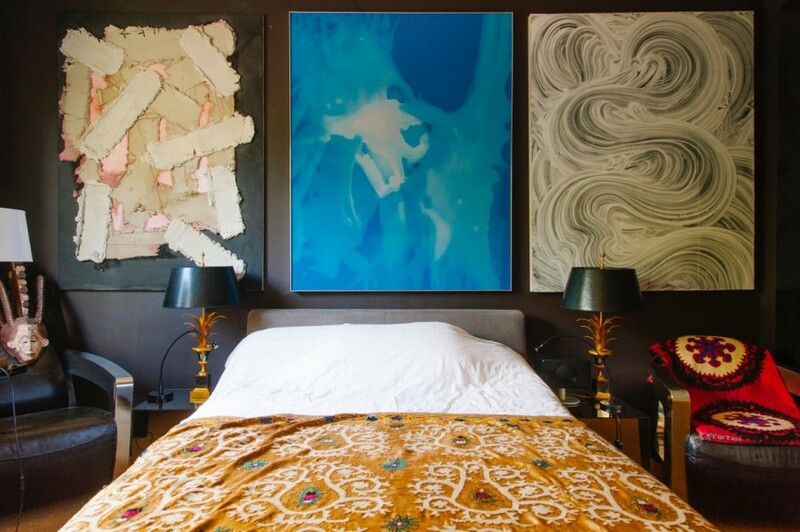 Your apartment is packed full of art. How do you hang the artworks? Is there any curatorial approach behind it? I follow my feeling in combining and hanging all the different pieces of art. This is “perpetuum mobile” — I am always trying to find the perfect balance and never seem to be able to quite reach the perfect setting. There is no curatorial approach. That is one of the advantages of being a collector. I do what I like. You are working as a lawyer. Do you also show parts of your collection in the office? My workroom and the office are packed with pieces of my collection. Then, does the art you present in your office differ from the one in your apartment? What do your clients and co-workers think about the works? In some ways, the art in my office differs from the art at home. I like strong abstract work. Many people don’t like that kind of art, sometimes because they think they don’t understand it. They seem to prefer figurative work. Therefore, I have to be a little bit cautious in my choice of hanging art in the general office space. Not all my colleagues like my taste. To solve this problem, the law firm has its own small art collection. Clients usually react in a very positive way. 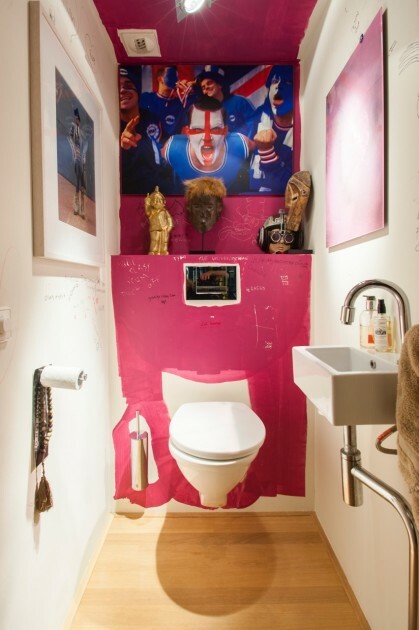 Toilet with “Robbie Williams” by Paul Smith, artwork by Nathan Azhderian, tribal art and artist’s graffiti. Courtesy of Antoine de Werd. The main reason to buy a piece of art is that I love the piece. The first visual impression is essential. When I am visually impressed, I then do my research. Not essential but can be fun and interesting. Your Instagram is full of artworks. Have you tried acquiring any artworks via Instagram or other social media? I buy quite some art via social media. Mostly it starts with Instagram (I love Instagram) and then I check the website of the artist and the related gallery. Artists, collectors and galleries also contact me through Instagram. Instagram has made it possible to be in contact with art people all around the world. In most cases, I had already seen other artworks of that artist in real life. My experience with buying art via social media is good. I think it is an important way for artists and galleries to sell art. I believe that the traditional gallery is going to disappear. New and more flexible galleries will appear. 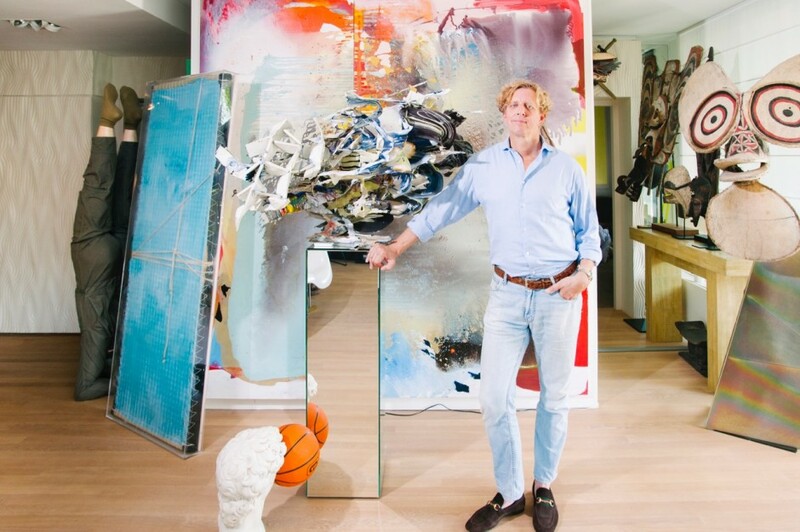 Antoine de Werd in front of his collection (from left to right: Yves Scherer, Jackie Saccoccio, Heringa Van Kalsbeek, Tribal art from Africa and Oceania and Just Quist). Courtesy of Antoine de Werd. I am always the happiest in the seconds after a purchase during a busy fair or in a gallery. Who inspires you in the art world? I don’t have an specific person in mind. In general, young artists inspire me. Can you name three emerging artists who should be on our radar? To mention just three is difficult. There are many promising emerging artists. I made a choice and would like to mention Peppi Bottrop (Germany), Florian and Michael Quistrebert (France) and Evan Robarts (US). On a final note, have a look at Graham Wilson.